Since November 2015, The Steelhead steampunk-themed community has been without a home after it's sims closed down. For most communities, this would have been the end. But most never left the group. Even though they found homes in other places, they never did forget the fun times they had back home. "Caledon is nice," Fuzzball Ortega, the community's sheriff and head DJ would say, "but it was not quite home." There would be some reminders. Club Gearz, the main club of the community, would reopen in Caledon. The location would also hold a community reunion. Finally in early March, Fuzzball stated he was now able to purchase, and hold onto, a sim that would be the new home for the community. 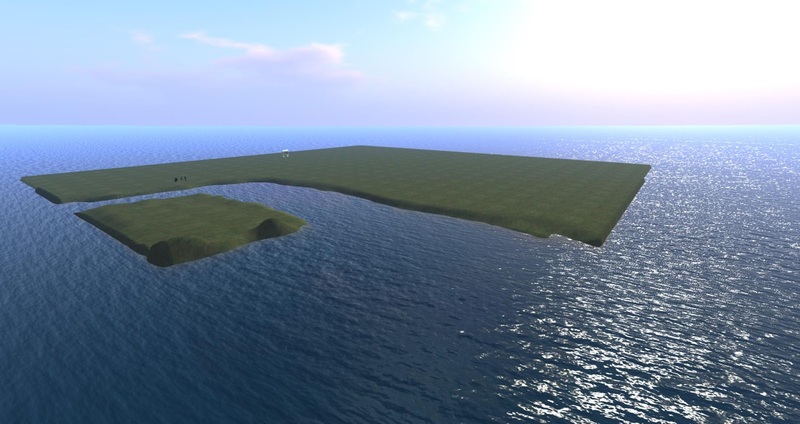 He soon annouced the sim was online, Steelhead Bay. But as it had just "literally rose from the depths," it was a blank slate with much to do. But over the following days, Fuzzball made gradual progress in planning and setting up things. He was planning in advance which places would be for homes, and which would be for other locations. 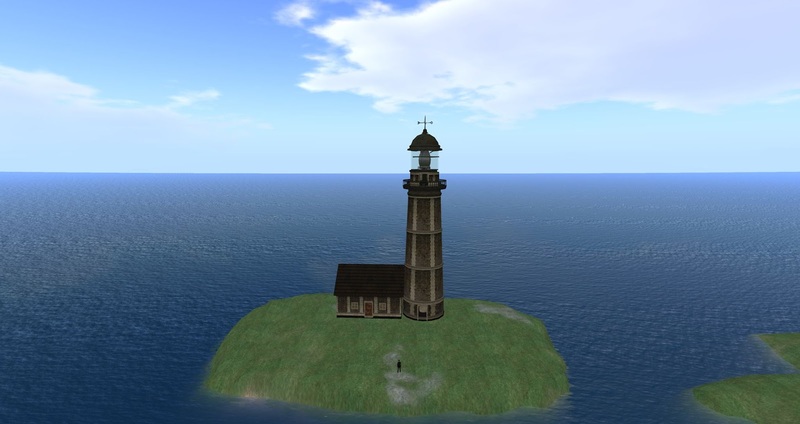 The first was a small lighthouse, "If nothing else, a good temporary build. Light is set to Auto, so when sun goes down, it comes on and rotates. ... Not as awesome as the Steelhead lighthouses in the past, but it'll do for now." But the lighthouse was just the first step. There would be many more buildings to come, the most important being the town hall. Fuzzball would state, "Finding the lighthouse was easy. Searching for an idea on the look for Town Hall ... not so much. My original idea (for) the ground floor was to have the sheriff's office and the meeting room. Second floor would have a few offices, and a classroom (although I have the 512 parcel next to the lot, just in case I go with a different idea). Also, haven't parceled it off yet, but I have a 1536m template laid out for a ballroom. A suggestion was made to have the ballroom be pat of town hall (hence the 512 parcel nest to the town hall lot for possible school house)." "Also, at one time we were using the Oregon state motto 'Alis Volat Propriis' (She Flies With Her Own Wings). I think it's fitting to use it again." But eventually, the town hall would be up, the parcels would be laid out, and Fuzzball decided it was time to open the place up to the community, starting with it's first town meeting since the estate's closing, "Spread the word. Tuesday evening. Opening Steelhead Bay for those in Steelhead groups, only. 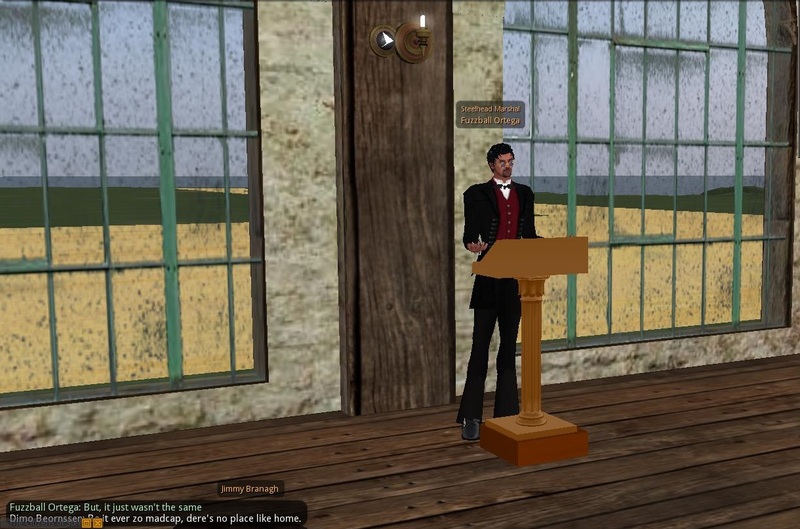 Town meeting, and potential renters can pick their lots. If I don't have the whole sim parceled out by then, let me know what you need, and I'll parcel it out for you. Please remember, this is my first time being a sim owner. Opening the sim up at 6PM." I had to be elsewhere, so I sent my alt Rezzdammit, whom was in the Steelhead group, over. 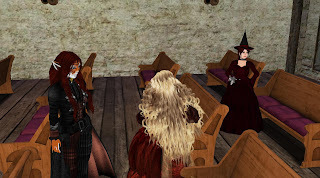 There were a number of others there, such as Willow Leafstorm, Jimmy Branagh, Baron Klaus Wulfenbach, (Baronin) Zantabraxus, Softpaw Sommer, Captain Veles Jägermonster, and a number of others. Fuzzball gave a few minutes for people to stumble over from the lighthouse, where the landmark given out led to. Then at 6:13PM, "Okay, Ladies and Gentlemen, I hereby call this first Steelhead town meeting in a very long time to order. Hoo if you got'em, and let the Floppy Dong count begin." And the air was quickly filled with cries of, "HOOOOOOOOO!!" Veles had to be reminded how the gesture worked, to which he replied, "Tenk hyu, Herr Scherriff. Vould nut be der zame mitout my hoo." Another Jagermonster, Dimo Beornssen, mused, "Iz amazing how qvick it all comes back, eh Veles?" He himself had a case of watery eyes, but insisted it was allergies and not crying. Fuzzball went on, "Okay, so, Steelhead Bay......I tried very hard to continue by living in Caledon, and hanging out in other places. But, it just wasn't the same. So, after working out some of my finances, I purchased this sim. I missed my Steelhead family, and it was time you guys came home." Softpaw commented, "I think we all feel the same." Dimo added, "Be it ever zo madcap, dere's no place like home." Fuzzball stated he wasn't alone in setting up the place, "I have had some help, and still getting help with setting it all up. Thad and Lumi came in world to assist. OldeSoul and Cassie Eldemar have been helping. Tensai and Lunar's typist have been extremely supportive. That being said, Tensai will be around, as will Lunar's typist in one form or another. But both requested not be doing any management duties. So, building and rp'ing, and having fun. That's their duties." Several people nodded and gave expression of support. Fuzzball continued, "To assist me in sim management, Thad and Lumi are listed as Estate Managers, but only on a very limited basis, mostly to help me. Purdie Uggla is listed, just in case I accidentally lock myself out of the sim.......I heard some estate owners have done that from time to time." Miss Kate (katelynn.inglewood) mused, "I have banned myself from a parcel in Steelhead. Lunar had to come help me (giggle)." Another whom would be assisting Fussball, "Helping me for the most part, will be Jimmy." Jimmy waved, then turned around and grinned, "Stay out of trouble." Fuzzball went on, "We still have work to do on the sim. Parcels needing to be set, street needs to be laid, docks need to be built. 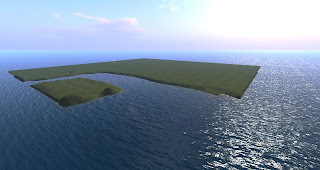 Some of my terraforming needs to be corrected. 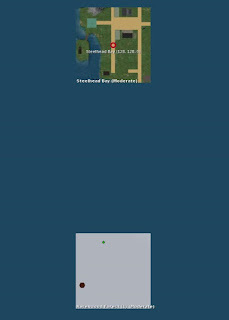 But, it was time to give you guys access, and together, build Steelhead Bay. I also have plans on creating a radio play for Krypton Radio, called Steelhead. Think Gunsmoke with Gears." Jimmy hammed it up, pretending to limp a short distance to the podium, "Mr. Marshal! Mr. Marshal!" Of Lunar's status, Fuzzball stated, "And since I want to tie it all together. 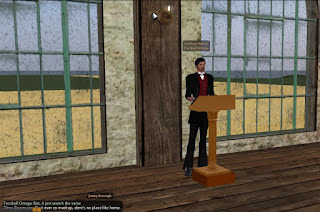 For roleplaying/storytelling purposes, TotalLunar Eclipse, although the avatar is no longer in SL, is the mayor of Steelhead ((No coming up to me and saying that Mayor Eclipse said you can do this and that, though)). His alt, by the way, built this building. Continuing, Fuzzball stated of the town hall, "Marshal's office will be on the second floor, with the jail cells.....so no criminals can tunnel their way out." Miss Kate asked about the school. Fuzzball answered, "Third floor is a loft, but there's the parcel next to this one that we can put in a school house." Jimmy commented, "Right next to the jail. How apropos." Baron Wulfenbach retorted, "For you, perhaps." Dimo mused, "Vun's de school, de odder's de school of hard knocks, ja?" Of other places, Fuzzball informed, "Club Gearz will also be moved to Steelhead. ... The big parcel template west of here, I'm thinking of rebuilding our original outdoor event area, the Kokopelli. And there's the large water area for underwater events. The lighthouse is pretty cool, by the way. it's set to estate time, so as the sun starts to set, the lighthouse will start to come on." Softpaw felt they "will need a good spot for the tea garden." Going on, Fuzzball stated, "Still setting parcels down, but I do have several 512 lots already set. If by chance you need a bigger parcel, I can combine them, or set you up in a place that hasn't been parceled yet. (I) haven't set up the payment methods yet, but give me a few days. I am reserving the lots for those interested." Softpaw grinned, "Yeah I'm gonna need bigger then a 512." Veles asked, "Vot about der hotel? Hyu gun haff vun uff doze, pliz?" Fuzzball continued, "As for Steelhead's setting. Still in the Pacific Northwest. Matter of fact, Lighthouse Island is to the west, this time. Before it was East. Haven't written the convenant yet, but you know, keep the builds in theme, no walking around with your Floppy Dong out, be nice or Tensai will blow you up. Same old same old." Miss Kate asked, "What about breedables?" Fuzzball answered, "Those are fine. Also, if you haven't checked the map. We're north of Ravenwood Forest. Sticking close to all family members." Fuzzball then got to a particularly important topic, "So, let's move on to Friday's event. What say I get Gearz plopped down and we have a dance here in Steelhead Bay?" There were cries of "YES!! and "HOOOOOOOOO!!" from the audience. Fuzzball then asked, "Okay, then. Anyone have a particular theme in mind? Other than Steelhead's Back B*tches?" They soon agreed to "New Beginnings." Fuzzball confirmed, "Okay, then. Friday, at Gearz, which will be put here in Steelhead, New Beginnings. And.....yes, I'll be playing 'This Is Home,' again." Softpaw added, "and all our other steelhead songs..I miss those." Fuzzball brought up Willow, "Tuesdays, now, in addition to town meeting. Willow Leafstorm has her show on Krypton Radio, Strange Transmissions. It's her comedy music show. You guys should be listening to it as we speak. Wednesdays, she has Swingtastic, featuring music from the Dieselpunk era, Electoswing and jazz. This is held at the Green Fairy Cabaret in Ravenwood Forest. If you have the time, do drop by and join her. Saturdays, she has The Steam Powered Cabaret, which is her steampunk themed show, also at the Green Fairy Cabaret. And Sundays, it's Planet Tokyo, which features the best in Anime and J-Pop music. 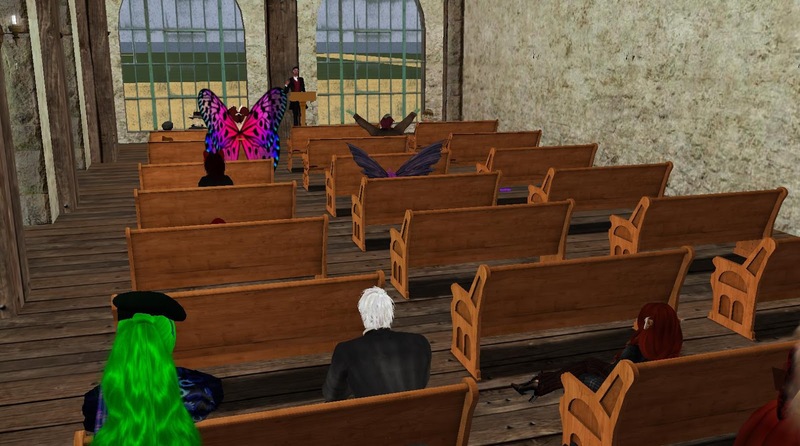 All shows are at 7:00 PM SLT and on Krypton Radio. May start doing my Monday night show in world if anyone is interested. That's at 7 and on Krypton Radio." Willow stated, "I will be making spring come soon in Ravenwood." Fuzzball went on to their Relay team, "Okay, now Relay For Life of Second Life. I've been busy with the sim, and we've only had one event so far. Thank you to Willow for the use of the Green FAiry for the event. We can go ahead and start planning more events. We also have our campsite builders. And this year's theme is Passport To Hope. Our total so far is L$48280. Lots of Relayers are happy to see Steelhead back in the game. Nita10 is a member of the Salmons. She's from outside the Steamlands but wanted to join our team. She is a survivor, although lost her voice to cancer." Someone asked about the New Babbage team, Fuzzball answered, "New Babbage doesn't have a team. Nor does Caledon. They all joined the Aether Chrononauts." Softpaw spoke, "Chronaughts was very welcoming and it was great to be there..but it just wasn't the salmons ..I felt lost on Relay day with out my fishes." Fuzzball concluded the Relay issue, "If there are any questions in regards to RFL, send me a notecard if I'm not online. I got a feeling my IM's are gonna start to cap. You can also email me, RFL or Steelhead business, at sheriff.ortega@gmail.com." Fuzzball then began the conclusion, "And for this week, that's all that I've got. I just wanted to open the sim up. Missed seeing everyone. Glad we got the Jaegers back. By the way, Genie is doing fine. She's dealing with RL. So, may not be in world a whole lot. Does anyone have anything that they wish to add or announce?" Softpaw stated, "The tea garden will be back but I am looking into a new build for it." Kara Kent assed, "I have acquired a new microphone, and the Virtual DJ, and am learning how to DJ." Fuzzball then concluded, "Put your pimping hats back on. Let's get the word out that Steelhead Bay is renting. Spread the word to the rest of the Steelheaders. Tell'em to come home. And if you have a spot already picked out, let me know so I can reserve it for you. ... Herr Baron if the consulate is interested in an embassy here, let me know what you need." "And this first meeting, is adjourned. Love you guys." There were more cheers and ""Hoooooo! "s, "Thank you for all this work you have done for us!" Some residents went ahead and left. A few stuck around for a while, chatting and happy to be in their new home. Softpaw Sommer would later post about the event in blog here. And so, the Steelhead community has a new beginning. What was once thought to be the end turned out to be a long night of which dawn is finally breaking.